Pope Francis will preside over the synod, which is scheduled for Oct. 3-28 and will bring together more than 300 cardinals, bishops, priests, religious and lay experts, including young people. In addition to their personal experience, synod participants will have at their disposal a working document that was based on: input from bishops’ conferences, religious orders, offices of the Roman Curia and Catholic organizations; on online survey open to anyone 16-29 years old; and a document prepared by more than 300 young people who met in Rome in March at the invitation of the pope. But just to make sure, young voices are still ringing in their ears, Pope Francis has invited hundreds of young people to join synod participants Oct. 6 in the Vatican audience hall for an evening of music and of young people talking about the search for their identity, hopes for their relationships and ideas for living a life of service and self-giving. The synod is not focused on increasing vocations to the priesthood and religious life, although that obviously is one of the concerns the pope and participants will discuss. The real topic is, in essence, the church, its present and its future. 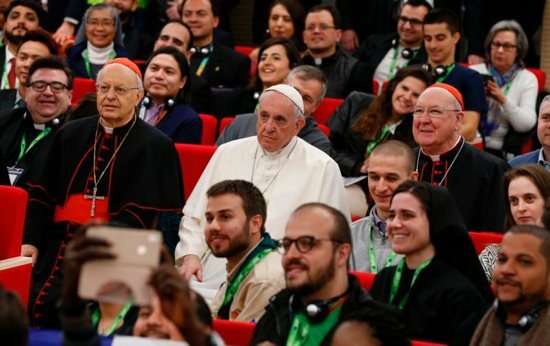 Addressing the presynod gathering in March, Pope Francis said the church and its members must reach out, ask what God wants of them and continually find new ways to respond to the hopes and needs of the world’s people. But to equip young people to take their rightful place in the church, church leaders must listen to them, be as honest as possible in responding to their questions and pass on to them the art of discernment. “Discernment is listening, first and foremost, that can also become a driver for our actions, the ability to be creatively faithful to the one single mission the church has always been entrusted with,” the document said. But reaching young people, educating them in the faith, preparing them for discernment and helping them live as Christians in the world involve addressing myriad issues, so the synod is expected to be broad. The 300 young adults who met in Rome in March mentioned those issues, as well as others. But underlying all their concerns was a request that church leaders recognize them as full members of the Catholic community, take their concerns and questions seriously and make a commitment to being real role models and mentors. The young adults, most of whom work for the church or are very active in their parishes or Catholic movements, said young Catholics need better education in what the church teaches. But they also need patient answers when they have questions about church teaching that do not seem to coincide with the values and practices they absorb from their cultures. At the same time, speaking for themselves and their peers, the young adults did not just stretch out their hands asking for help. They also offered it, if church leaders were willing to open space for them. “The church must involve young people in its decision-making processes and offer them more leadership roles” on a parish, diocesan, national and international level, they said.